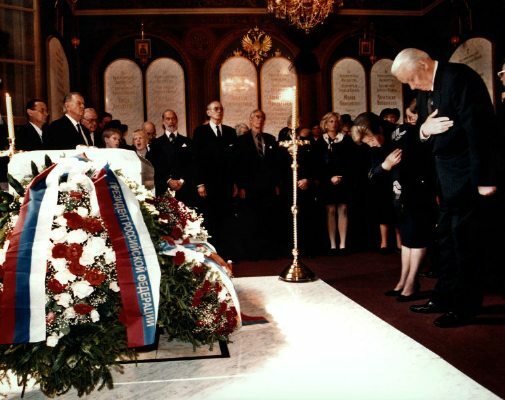 On 17 July 1998, eighty years to the day after their murder in the cellar of the Ipatiev House at Ekaterinburg, the earthly remains of Emperor Nicholas II, his family, Dr Botkin and the three faithful servants were finally laid to rest in St Petersburg´s Saint Peter and Paul Cathedral. Over fifty members of the Romanov Family and their close relatives traveled to Russia from all corners of the world, from Australia, North and South America and Europe. President Yeltsin announced his presence at the ceremonies as well as many ambassadors, politicians and prominent personalities. From Britain, Prince Michael of Kent and from Germany members of the Oldenburg dynasty, both closely related to the Romanovs. St Petersburg, 17 July 1998. 2. Michael Andreevich and wife Giulia. 3. Nicholas Romanovich and wife Sveva. 4. Andrew Andreevich sen. and wife Ines. 5. Nikita Nikitich and wife Janet. 7. Paul Dimitrievich and wife Angelika, with granddaughter Audrey de Young. 8. Rostislav Rostislavich sen. and wife Tia. 9. Olga Andreevna, and her son Francis Matthew. 10. Natalia Nikolaievna and her daughter Nicoletta. 11. Alexis Andreevich and wife Zoetta. 12. Paula Pavlovna and her children Alexander and Makena Comisar. 15. Andrew Andreevich jun. and wife Elizabeth. 21. Nicoletta Arcelus, daughter of Princess Catherine Ioannovna with her sons Victor-John and Sebastian, with Julia Renner. 22. Fiammetta Zanelli, daughter of Princess Catherine Ioannovna with her husband Mr. Ideal Zanelli and son Alessandro. 23. Tatiana Beadleston, daughter of Marina Vasilievna. 24. Nancy Wynkoop, daughter of Princess Xenia Gheorgievna. 25. Xenia Sfiris, granddaughter of Princess Irina Alexandrovna. 26. Michael of Kent, grandson of Grand Duchess Helen Wladimirovna. 27. Natalia Iskander, granddaughter of Grand Duke Nicholas Constantinovich. 28. George Yurjevsky, great grandson of Emperor Alexander II. 29. Emmanuil Golitzin, great-grandson of Grand Duchess Catherine Mihailovna. 30. Huno of Oldenburg, great-great-great-great grandson of Grand Duchess Helen Pavlovna and his family. 31. Constantine Melnik, grandson of Dr E. Botkin with his granddaughter. 32. Mr Haritonov, grandson of the cook Ivan Haritonov. 33. Natalie Demidova, grand-niece of the maid Anna Demidova. Afghanistan: Ambassador A.V. Assefi and First Secretary G.S. Gheyrat. Australia: Ambassador D.R. Bentley & Mrs Bentley. Equatorial Guinea: Chargé d'Affaires pro-tempore Ambassador A.H. Ngena Nchama. France: Ambassador Hubert Colin de Verdier and M. Olivier Mauvisseau, Consul General in St Petersburg. Germany: Ambassador Ernst-Jorg von Studnitz. Ghana: Ambassador Dj.E. Bava and Minister Counsellor Mrs. N. Bema Kumi. Great Britain: Ambassador Sir Andrew Wood and Mr. John W. Guy Consul General in St Petersburg. Guatemala: The Ambassador, pro-tempore 'doyen' of the Diplomatic Corps. Holy See: Archbishop Mgr Bukovsky and the representative in Russia Archbishop Mgr Tadeusz Kondruszevicz. Hungary: Ambassador D. Nanowski and his wife Mrs M. Heresch and Attaché: T. Madjar. Italy: Ambassador E. Scammacca del Murgo e dell'Agnone and Baroness Scammacca del Murgo e dell'Agnone. Kenya: Ambassador D.I. Katambana and Mrs Katambana. Korean Republic: Ambassador Mrs Li In Ho & Counsellor Mr Kim Il Su. Nicaragua: Ambassador J. Bautista Saxa. Nigeria: Chargé d'Affaires pro-tempore Mr V.O. Akinsania. Sovereign Military Order of Malta: Frà M. Turnauer, Representive in Russia. Spain: Ambassador J.A. de Iturriaga Barbaran. Sweden: Ambassador S. Hirdmann and Mr H. Ulsson Consul General in St Petersburg. Uganda: Ambassador K. Onyanga Apar. Standing, from left to right:Ines, wife of Andrew Andreevich Sr, Andrew Andreevich Sr, Zoé, wife of Alexis Andreevich, son of Andrew Andreevich Sr, Peter, son of Alexis Andreevich Sr, Elizabeth , wife of Andrew Andreevich Jr, Andrew Andreevich Jr, Xenia Sfiris, great-granddaughter of Grand Duchess Xenia, Sister of Tsar Nicholas II, Paul Dimitrievich, Nicholas Romanovich, Dimitri Romanovich, Nikita Nikitich, Sveva, wife of Nicholas Romanovich, Natalya , daughter of Nicholas Romanovich, Francis Mathew, son of Olga Andreevna, Dorrit, wife of Dimitri Romanovich, Xenia Andreevna, Michael Andreevich, Nancy Wynkoop, daughter of Xenia Georgievna, Giulia , wife of Michael Andreevich, Olga Andreevna. 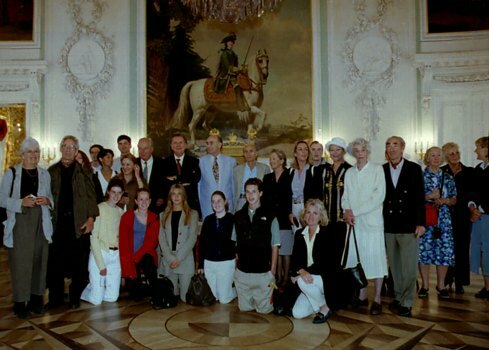 Kneeling, from left to right: Catherine Dimitrievna, granddaughter of Paul Dimitrievich, Makena Comisar, daughter of Paula Pavlovna, Nicoletta, daughter of Natalya Nikolaevna, Audrey de Young, daughter of Anna Pavlovna, and granddaughter of Paul Dimitrievich, Alexander Comisar, son of Paula Pavlovna, Paula Comisar, daughter of Paul Dimitrievich.